Professional grade heavy duty steel construction. Durable proprietary powder coat fish. CNC robotically spun and ribbed discs with rolled edges provide strength, safety, and durability. Hose size (in.) 3/8 in. Compact two reel assembly for dual hose applications, each reel operates indenpendently. Guide arm adjusts to wall, floor & overhead positions. Best quality Air/Water Hose Reels, China Air/Water Hose Reel, low price Hose Reel, Air/Water Hose Reel, Hose Reel, Economic Air/Water Steel Hose Reel, Steel Hose Reel. ONEREEL is specialized in the design and manufacture Wire Spools, Plastic Spools, Steel Cable Spools, Warp Knitting Beam, Cable Spools, Steel Wire Reel, Stainless Steel Spool, Corrugated Wire Spool, Collapsible Cable Reel, Aluminum Spool, Punching Wire Spool, Skeleton Cable Reel, Pulley Block, Hose Reel, Nylon Spool, Yarn Bobbin in the industry since 1991. All of our customer spool and wire carrier are engineered and manufactured in our 120,000 square foot state-of-the-art manufacturing plant located in Ningbo, Zhejiang. To support the Transmission work, ONEREEL has series of Air/Water Hose Reels, Automical Air Hose Reel, Retractable Air Hose Reel, High Quality Steel Hose Reel, High Pressure Spring Loaded Hose Reel, Economical Hose Reel- all are OEM and professionally produced per ISO 9001:2008, which are being sold to over more than 50 countries in the world. Some items like Emergency Restoration Tower And Crossing Structure, we can customized, and the Safety Tools And Accessories, are not demanded the MOQ. You can freely help you out either Tech issue or Products requirements. Pls approach us. Thanks. NINGBO BEILUN TIAOYUE MACHINE CO., LTD. (ONEREEL)is one of the leading empty spools manufacturers and exporters in China. Company located in Ningbo City,near Ningbo Seaport and Ningbo Airport. ONEREEL is specialized in the manufacture of reels for cables and electric wires, iron axles, disc spool for steel cables and various delivery reels.With strong technological capabilities and full series of production equipment. All of our products go through the dynamic and static balance tests. We have passed the quality system certification ISO9001:2000 to ensure the product quality. Following the standards of GB4004-83, JB/T8997, DIN46395 and DIN46397 in productions. We can design and tailor various non-standard items subject to the specific requirements of the customers. Focusing on top quality, superior innovation, reasonable price and strong competitiveness, our products have been appreciated and recognized by majority of customers. So far we have built long-term cooperation with more than 60 well-known enterprises from domestic and oversea market.The company hold on philosophy of "Create value, Quality first, Credit first". Effective and Strict internal management, precisely control quality and delivery time, pursuing integrity services, we always put customer satisfaction as the highest goal. ONEREEL sincerely hope tightening cooperation with domestic and oversea customers and create bright future hand in hand! 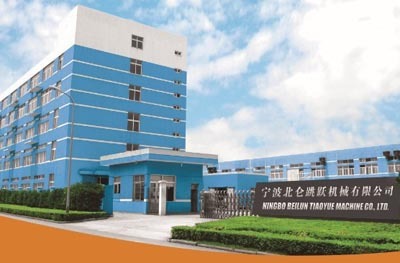 Company Name: NINGBO BEILUN TIAOYUE MACHINE CO., LTD.